We invite you to join us for our 2019 Spring Concert happening March 31st, 2019 at 7:30PM in Hart House Great Hall. We hope to see you there! Welcome to the Hart House Symphonic Band! Our group is comprised of students and alumni from different disciplines who come together to make music. We have an exciting and dynamic repertoire lined up for the 2017-2018 season. This will be the main location where you can get the latest updates and news concerning one of the premier music groups of Hart House at the University of Toronto. 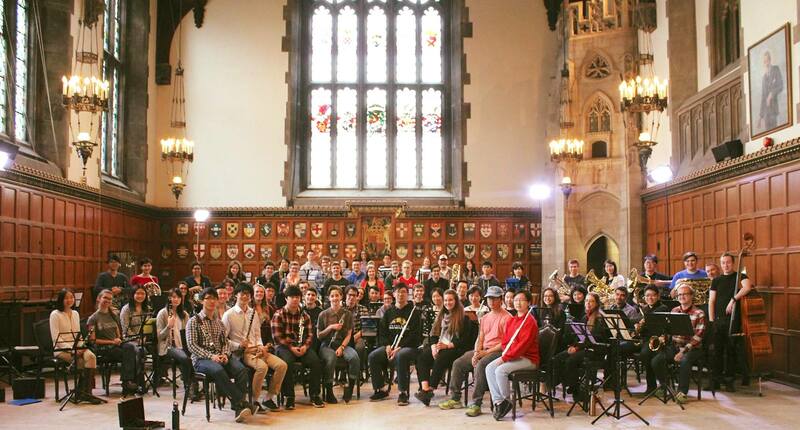 Weekly rehearsals are held on Tuesdays from 5:45pm to 7:45pm at the Great Hall at Hart House, and we perform twice throughout the course of the year. For more information, please click the concerts link to your left. For more information about the ensemble, please email us at hhsb.utoronto@gmail.com. Attention members: If for any reason you will not be able to attend rehearsal, please email <hhsb.utoronto@gmail.com>.